The Group Rep presents the west coast premiere of Frawley Becker's searing drama "Tiger by the Tail" directed by Jules Aaron, produced by Richard Alan Woody and Frawley Becker. The play runs March 6th through April 19th, Fridays and Saturdays at 8PM, Sundays at 2PM, at the Lonny Chapman Theatre located at the edge of the NoHo Arts District in North Hollywood, CA. Through a series of letters, a middle-aged therapist in California hits it off with a young Florida inmate after responding to his personal ad. 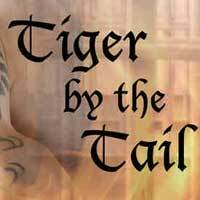 Tiger by the Tail tells the extraordinary story of their complicated, burgeoning relationship. Located on opposite sides of both the country and the penal system, the two men manage to arrange a meeting and a life together seems possible, but the harsh realities of prison life rise up against the couple. Tiger by the Tail, a must see for its cutting edge humor and a most unusual "love story", was honored as Best Play at the 2005 Festival of New American Plays in Richmond, followed by a full production in New York. Cast includes the talents of Todd Andrew Ball, Dave Buzzota, Michael O'Neil Callaghan, Lareen Faye, Michael Taylor Gray, Bob McCollum, Marco Parra, Lloyd Pedersen, and Steve West. About the Playwright... Frawley Becker (Playwright) is a published book and short story writer, as well as published and three-time prize-winning playwright. After graduating from University of Pennsylvania he attended Ruskin School of Fine Arts in Oxford, England. He was then hired by the State Dept. as an Entertainment Director for American military bases outside Paris, during the Cold War. He founded the first African-American theatre company within the U.S. military in 1959. In 1963 he formed Paris Playhouse and became its Managing Director, producing the first Edward Albee plays professionally in France and bringing actors over from New York. Princess Grace of Monaco and the British Ambassador to France were in attendance at the gala opening. For the next ten years he worked as a bilingual dialogue coach in films while living in Paris, coaching Audrey Hepburn, Peter O'Toole, Rex Harrison, Omar Sharif, Jacqueline Bisset, Ann-Margret, Samantha Eggar, Robert Ryan, Gene Wilder and all the Oompa-Loompas of the original Willy Wonka and the Chocolate Factory. In Hollywood he worked as a location manager for feature films Jerry Maguire, Steel Magnolias, Summer Rental, Suspect, the originalFootloose and others, and TV movies for Oprah Winfrey Presents. He was a production executive at The Disney Studios for two years. He is most proud of his name being inscribed on the Wall of Tolerance at the Civil Rights Memorial Center in Montgomery, AL; being listed inWho's Who in America since 2004; and being a U.S. Army veteran. About the Director... Jules Aaron (Director) most recently directed the critically acclaimed Blonde Poison with Salome Jens, Undercurrents, and The Circle,Kin for Theatre 40. Other theatres: Artistic Director - Grove Shakespeare Festival; director at Public Theatre (NY Shakespeare Festival), South Coast Rep, Actors Theatre of Louisville (Humana Festival) Pasadena Playhouse, Utah Shakespeare Festival, ICT, McCoy/Rigby Prods., Laguna Playhouse, Philadelphia Theatre Co., TheatreWorks, Colony Theatre, and Walden Media Prods. In recent years he also helmed the world premiere of Ethel Sings at Soho Rep in New York, the world premiere of At the Bistro Garden at Two Muses Theatre in Michigan and the world premiere of The Ghost of Gershwin at GRT. Other directing credits: Julianne Moore, Bug; Don Cheadle, Strider; Bruce Davison, To Kill a Mockingbird; Mercedes Ruehl, Bang Bang Blues; Alan Mandel, The Tempest; Joan Van Ark and David Birney,MacBeth; Ralph Waite, The Gin Game; Michael Learned, Southern Comforts at ICT and at Garry Marshall's Falcon Theatre. Awards: L.A. Drama Critics Circle, Garland, Drama-Logue, Backstage West, Bay Area Drama Critics, Denver Critics Awards, Granada Chair (UC Davis), Santa Barbara Critics Circle and 4 Stagescene LA Awards (2011-2012) for directing Southern Comforts, Private Lives,Hunger: In Bed with Roy Cohn and The Paris Letter (Critics Pick L.A. Times and Backstage West). Mr. Aaron was recently garnered the Robby Living Legend Award from journalist Rob Stevens. About the Production Team... Richard Alan Woody (Producer), a member of The Group Rep for 12 years, directed Doug Haverty's Next Window Please, Lee Blessing's A Walk in the Woods, Gene Casey's Theatresongs, the Casey/Buhrer Musical Milagro, Frances Mizrahi's Closets, Phil Olson's A Nice Family Gathering, Craig Alpaugh's Neighborhood Crime Watch and Jeffrey Sweet's Bluff. He also helmed Linda Steinbaums's Fat Chance and Jeremy Kehoe's Ready, Aim, You're Fired, both at the NoHo Actors' Studio, as well as the L. A. Premiere of Yazmina Reza'sLife X 3 at the Asylum in Hollywood. Max Kinberg (Original Music) has been working with Jules on many of his plays which include Southern Comforts by Kathleen Clark, Ethel Sings, Hunger: In Bed with Roy Cohn, both by Joan Beber, Wait Until Dark by Frederick Knott, Private Lives by Noel Coward, The Paris Letter by Jon Robin Baitz, and now Tiger by the Tail by Frawley Becker. Max's musical theater piece On Rosen Street will be given a staged reading in the late spring. Michele Bernath (Choreographer) recent credits include The Ghost of Gershwin, Polyester, Stiltz & A Christmas Carol. Acting credits at The Group Rep include Boeing Boeing, Awake and Sing, Stepping Out, A Nice Family Gathering, Chaim's Love Song and String of Pearls. Other L.A. appearances include The Beat Goes On, Sidetracked and Broken Glass and on tour in Hello Dolly, No No Nanette and West Side Story. TV credits include "Columbo," "Murder She Wrote," "Taxi" and "Laverne and Shirley." Michele has her MFA from UCLA. The Creative Team includes: Chris Winfield (Set Designer), J. Kent Inasy (Lighting Designer), Angela M. Eads (Costume Designer), Steve Shaw (Sound Designer) and Doug Haverty (Graphics Designer). About the Cast... Todd Andrew Ball (Slocum) makes his debut with The Group Rep in Tiger by the Tail. Todd was most recently seen in the role of the Bellhop in Lend Me a Tenor at the Glendale Centre Theatre. Other credits include Jack in Leading Ladies, the Creditor in The Guardsmanat A Noise Within Repertory Theatre and Lov Bensey in Tobacco Road. Dave Buzzotta (The Criminal) began as a child actor in NY theatre leading to a stint on Broadway, dozens of commercials and numerous TV roles. Dave has appeared in over a dozen features, appearing opposite Christopher Walken, James Franco, Paul Walker and Rod Steiger. He recently appeared on stage in the World Premiere of Ingmar Bergman's The Day Ends Early in Faro, Sweden. As a writer, Dave is shopping an animated series, a 1 hour drama and a feature for his band. Michael O'Neil Callaghan (Maynard) A staple in the Los Angeles Indie Improv Comedy community, Michael is thrilled to sink his teeth into dramatic work again, especially for a role like "Maynard." Find him Monday nights hosting "One Love Improv" at the Clubhouse in Los Feliz. Lareen Faye (Miriam) has been a member of The Group Rep since 2005. During her years of membership, she is most proud of the work she did in The Group Rep Productions of String of Pearls., Enchanted April and creating the role of Mrs. Weiss in the GRT world premiere of The Howie Monologues. Michael Taylor Gray (Jerry) earned his AEA membership doing theatre in Los Angeles - in notable plays such as Del Shores' Southern Baptist Sissies, Pageant - The Musical Comedy Beauty Contest, The Bacchae, and most recently, Bitchslap! in which he played Hollywood icon, Joan Crawford. TV appearances include "Without A Trace" and "Will & Grace". Film appearances include director Bill Duke's "Not Easily Broken". Bob McCollum (Kelly) A member of The Group Rep since 1997, credits include Stories About the Old Days, Inspecting Carol, Sylvia, Lend Me A Tenor, Come Back Little Sheba, RUR and two Bill Harris plays: Up and Gone Again and Robert Johnson: Trick The Devil. TV credits include "CSI", "The X-Files", "The Bold and the Beautiful" and "General Hospital." Other credits include a music video drama "Testify" by the rapper/actor "Common". Marco Antonio Parra (Alfredo) is a Mexican-American, born and raised in the border town of Nogales, Arizona. Marco has been a professional actor for six years; appearing in over six national commercials. Marco's TV appearances include "Jimmy Kimmel Live", "Prank My Mom", and "America's Most Wanted". Marco stars in the upcoming film "A-Guruphobia", as well as in his own mini-series "Chasing Skirts". www.marco-parra.com Lloyd Pedersen (Peter Gordon) most recently appeared in the world premiere of Affluence at Theatre 40, and at GRT in Jules Aaron's critically acclaimed The Paris Letter (Eddon & LA Scenes Awards), Someone Who'll Watch Over Me, My Three Angels, Baby, Heroes, The Prisoner of Second Avenue, Theatresongs, and The Sunshine Boys (ADA award), among others. Lloyd has been a member of The Group Rep since 2004. Steven West (Marcus) has been seen in "Space Cowboys", "The Bold and the Beautiful", "Bring It On: All or Nothing", "Bring It on Again", "Walking Across Egypt", "The Confession", has recurring roled on the TV series "Sheena" and on "Jimmy Kimmel Live!" His stage credits include Reuben in a west coast revival and sold-out run of Charles Fuller's Obie award-winning play Zooman and the Signhere in Los Angeles.